GeoTile and VersaTile products from the Ted Baker collection. Leading UK manufacturer British Ceramic Tile will be making its debut at The Big 5 this year, bringing its inspirational range of ceramic and glass wall and floor tiles to the Middle East. A company with design and market trends at the heart of each collection, British Ceramic Tile will be revealing its exclusive partnership with global lifestyle brand Ted Baker at the show as well as unveiling its stunning selection of structured glass. Both collections are set to stimulate the imaginations of architects and interior designers alike, fusing together British design and heritage with high quality materials and innovative production techniques to transform domestic and residential design schemes from something ordinary into extraordinary, says a spokesman for the company. British Ceramic Tile’s head of global sales Heidi Normanton comments: “The Big 5 was a natural choice for us as it’s the largest meeting place for the construction industry in the GCC. A talking point on its stand at The Big 5 will be British Ceramic Tile’s exclusive launch of its Ted Baker collection to the Middle East market. A fashion-forward selection of wall and floor tiles and glass splashbacks, the Ted Baker Residence collection blends British Ceramics Tile’s unique manufacturing heritage with Ted Baker’s eye for detail and appreciation for a tile with style. Inspired by the Edwardian tiles that lead up the pathways of London’s iconic townhouses, the eye-catching GeoTile combines a sleek grey colour palette with Ted Baker’s favourite geometric prints. Made from high-specification porcelain, GeoTiles can be used inside or outside, on both walls and floors. The multi-use porcelain ParqTile comes together to form a classic parquet effect for use on walls or floors, indoors or out, and is available in contemporary grey or traditional brown. The contemporary ArTile collection is designed to work as stand-alone pieces of wall art or kitchen/bathroom splashbacks, with vintage-inspired glass artwork featuring in each piece. The TacTile collection features a 3D-effect textured tile in grey and a classic matt white. The structured wall tiles can be combined harmoniously with multi-use plain ceramic tiles from the VersaTile range, available in a variety of colours. The Feature Floors collection ... striking floors. Designed to replicate nature and imitate the appearance and intricacies of real stone, the HD collection from British Ceramic Tile has been created using the latest in high definition inkjet technology. “The collection takes stone and wood-effect ceramic tiles to a whole new level of design, making them virtually impossible to distinguish from the real thing, such is the quality and accuracy of the print,” she says. The latest additions to the collection include Accolade and Medal. Accolade, with its soothing, organic colour palette takes inspiration from natural sandstone. With an elegant wave-like design and textured ceramic surface, Accolade is designed using the latest in high-definition 3D and is available in oak or grey with a matt finish. Created using HD Ultra, which captures even the smallest of design details, Medal recreates the naturally luxe look of marble on to a ceramic tile and exudes elegance with its beautiful detailing. These tiles are available in conker with a gloss or matt finish, and are suitable for use on both walls and floors. A Henry Grey pattern from Feature Floors. 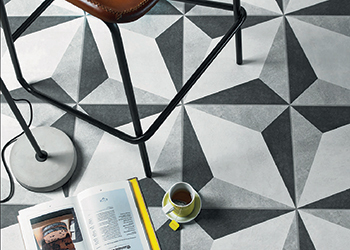 Meanwhile, the Feature Floors collection is designed to create floors with the ‘wow’ factor. Made using the latest HD inkjet technology, the range helps create a statement floor, offering a wide choice of designs from imitation marble effects to decorative patterns and motifs. 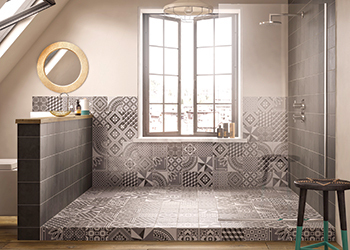 “Hugely on-trend, the Feature Floors collection marries stunning contemporary and traditional designs with the practicalities of ceramic tile for a range that will transform floors, while providing a hardwearing option for high traffic areas,” Normanton explains. 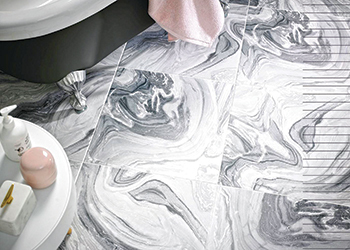 British Ceramic Tile is one of the UK’s leading ceramic and glass tile manufacturers. With a history of manufacturing ceramics for over 100 years, the company has a long established heritage of producing quality wall and floor tiles. High quality, design-led products supported by high levels of customer service and a strong brand proposition have enabled British Ceramic Tile to build a sound reputation for customer-focused wall and floor tile solutions. The company also has a serious commitment to its environmental responsibilities. From its world-class factory in Devon, England, the company supplies to independent tile retailers, DIY (do-it-yourself) retailers, housebuilders and specifiers, both nationally and overseas. Keeping market trends and design at the heart of each collection, the company offers ceramic and porcelain through to glass, natural stone and decorative products and also collaborates with some of the UK’s most iconic British designers including Ted Baker, Laura Ashley, Conran and the V&A Museum. Recent high-profile specification projects include the London Underground, Olympics, supermarket giant Tesco, restaurant chain Yo Sushi and the Hilton Hotel Group. British Ceramic Tile can be visited at Stand 7D281 at The Big 5.